It is recommended that you choose a charger with a similar or larger capacity (mAh) than the device you wish to recharge, i.e. most phones have 2000mAh + batteries and most Tablets (Nexus, iPad etc) 4000mAh + batteries. 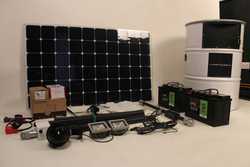 Decide how much portable power you need and whether you would also like the benefit of solar trickle charge on top. All recharge from mains/PC/USB and the solar also from any direct light. All the power banks will also work with our Solar Panel Chargers. Click a picture for further details. All prices include VAT. Solar power banks with inbuilt usb charged batteries that can be recharged from the mains, car and solar panel. 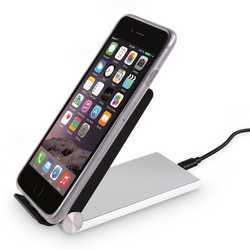 These universal solar chargers can recharge any phone, including iPhone upto 7 times. Ideal for Camping, Travel, Cycling and Festivals. 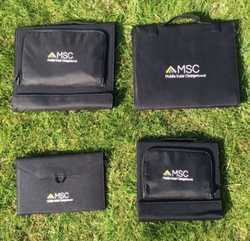 Our specialised range of portable folding monocystalline or Sunpower solar chargers have been up Kilimanjaro, Everest base and crossed the Atlantic. The smaller light weight 9W,12W, 15W, solar panels will charge any 5v usb device, the larger 20w, 60w and 100w 18v can directly charge 12v batteries. These portable rechargeable usb power banks provide portable power to recharge all phones, Tablets and any 5v portable device on the Go. They range in capacity from 1-8 phone charges and include waterproof chargers and combined jump starter power banks. All will recharge also from our solar. They retain their charges for months. 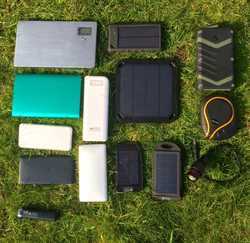 Special offer portable phone chargers, usb power banks and solar chargers for Festivals and Camping. 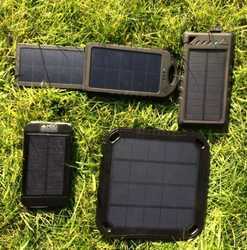 These Camping and Festival solar chargers and portable power packages have been selecyted to add value and flexibility. Wireless charging and wireless mobile phone chargers. Our QI wireless phone charging pads and wireless receivers enable wireless mobile phone charging for Samsung Galaxy, iphone 4, iphone 5 and all wireless enabled smartphones, including most Nokia Lumia and Google Nexus. 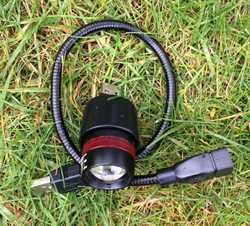 A selection of very useful accessories for travel and camping, including LED usb lights and torches, dual micro usb leads, usb plugs and multi usb chargers. 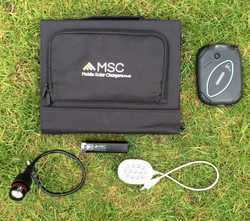 The Patented MSC Solar Charging Can gives Green renewable power off-grid. It can be used for phone charging, lighting, CCTV, WiFi for Festivals, Events, Emergency Relief and many off-grid Applications.